I am so so happy it is finally the beginning of the summer! Here in Spain the weather has been a bit weird recently and we have not many sunny days yet, which makes me even more excited for the so long awaited start of the summer! Last week marked exactly one year since I moved to Barcelona..I cannot believe how fast the time passes. Among the many reasons why I chose Barcelona, it is clear that the beach and the super good weather were within the top! Coming from rainy London, I honestly expected to start going to the beach in March and to my surprise, the weather had its own plan! Not only that it snowed twice in Barcelona this winter (ok, it snowed for like 20 minutes and all the snow was gone in 2 hour, but still..), the weather kept weird and we still haven´t enjoyed much of the sunny days nor the beach.. I changed my closet and put away the winter dresses about 2 months ago, but honestly still haven´t had the chance to put on most of my new summer picks! I am such a summer fan that I spend most of the year looking at summer clothes and planning my closet, so to move to Spain and to still not be able to wear my summer clothes in June is like the biggest drama of my life (just kidding, or maybe not..). So last weekend I got super excited when I woke up and the sun was finally out! Ah, I have been waiting for the chance to put on my new favorite summer dress and that was the perfect moment! 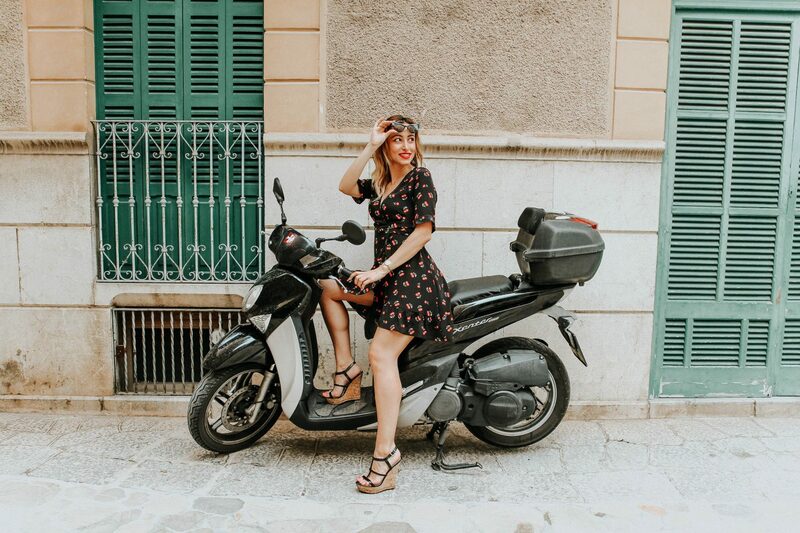 We were in Soller, one of the most charming towns in Mallorca and I spent the whole day exploring in my cherry dress! It might be too soon to say, but I honestly think that this dress is my fav for summer 2018! I am so in love with the cherries that I even got a top with the same design! You will see it soon on my instagram! And you, do you have any favorite new clothes for this season? Previous Post What is Fast Fashion and Has it Made the Clothing Industry More Unfair?